RangeVoting.org - Honeybees use range voting! Go to the bee, thou poet; consider her ways, and be wise. – George Bernard Shaw, Man and Superman, 1903. ...these homeless insects do something truly amazing; they hold a democratic debate to choose their new home. – Thomas Dyer Seeley, Honeybee democracy, 2010. Honeybees (Apis Mellifera jpg) have been "voting" in single-winner "elections" for 20-50 million years. They've held far more elections than humans, for a lot longer, and to decide something that mattered to each bee voter a lot more than most election winners matter to most human voters: where should we locate our new nest? With computers we can easily run millions of simulated elections, but even that number is dwarfed by the number of elections that bees have experienced, which exceeds hundreds of trillions. So it behooves us to ask: what election method do bees use? Bee election performance – how good are they? Each spring, about half the inhabitants of each beehive leave with their queen to start a new hive, in a swarm usually containing between 2000 and 20000 bees. The most important decision they need to make is: where to build that new hive? The penalty for choosing poorly is large: they'll die next winter, get eaten by a predator, be unable to raise as many larvae, need to do more work over the next year and thus suffer a large disadvantage relative to wiser bees, etc. They usually find about 20 different options within about 100 square kilometers, and about 90% of the time, the bee swarm succeeds in selecting (what appears to entomologists to be) the best one. Occasionally, however, they select a sub-optimal choice or even fail to reach a decision. The latter is very bad since there is only one queen – who cannot be divided in two! Details: Lindauer in observing 19 swarms reported 2 that failed to reach a decision. In the first, the swarm split in two, each trying to get the queen to go to its choice; but after it became clear this attempt failed, the swarm rejoined and recommenced negotations, which after two more days resulted in an agreement. 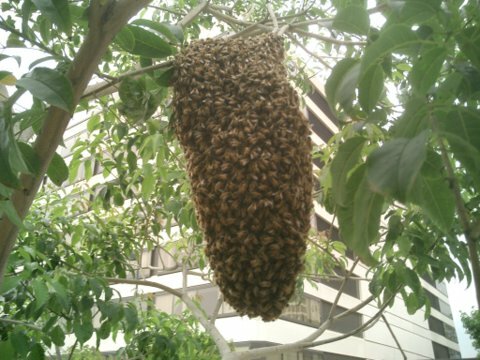 In the second instance, the swarm had still failed to find an attractive housing option even after 14 days, at which point it ran out of stored food and inclement weather approached. It then, apparently as a fallback option, decided to construct the new nest in open air right then and there, contrary to the usual policy of nesting in natural hollows. Open air nesting usually leads to the death of the hive in the winter, but in this location the winters were mild enough to make survival probable. So bees, while not perfect decision makers, are quite good. To provide a little perspective, consider the "plurality voting method" that is the most commonly used system in human single-winner elections. My computer simulations show that 1283 plurality-voters, given 10 choices, (each voter regarding each choice as worth a fixed standard-normal-random-number "dollar amount," all randoms generated independently before the experiment begins) will succeed in choosing the best choice (maximum sum of dollar values) 32% of the time. While 32% is better than just making a random guess (10%), it's far worse performance than bees. If the simulated-humans instead employ "approval voting" (approving choices with value greater than midway between the best and worst available) then they get the best choice 54% of the time – better, but still far worse than bees. If the humans use 0-100 "range voting" (scoring the best choice 100, the worst 0, and the rest linearly interpolated) then it's 79%. That is at least approaching bee-like decision-making quality. Bees have little or no motivation to be dishonest by "strategically exaggerating" in their votes, or "not voting for my true favorite because that would risk wasting my vote." In those respects, humans are a little "too clever." But the explanation it isn't that simple because dishonesty was not the reason for our poor performance in this computer simulation, since the simulated humans voted completely honestly – the main reason there was different voting systems. However, honesty does something to do with it: If the humans had simply honestly reported their dollar values then we could select the best choice (in terms of total dollar value) 100% of the time. While that might initially sound like a great idea, unfortunately even a single dishonest human could then report some enormous "dollar values" and throw the election, so that system would be unacceptable (plus most decisions do not have exactly measurable "dollar values" in some common agreed units such as "dollars" anyway). So we need to restrict the votes to some fixed range to prevent one fanatical human from singlehandedly throwing the election, and then humans often will use the maximum for one candidate and the minimum for another in order not to "waste their vote," in which case already there is some "dishonest exaggeration" in the mix which cannot be avoided. That is not so terrible because (a) even if every human voter exaggerates every range vote to the max, we would then just have approval voting, which is still a good deal better than the plurality system, and (b) experimentally, most human range voters do not do that. It is known that only 5% or fewer of the bees are "scout bees" that actually find and examine the candidate nest-sites. Conceivably, only bees that are above-average in scouting and judging ability, do the scouting. 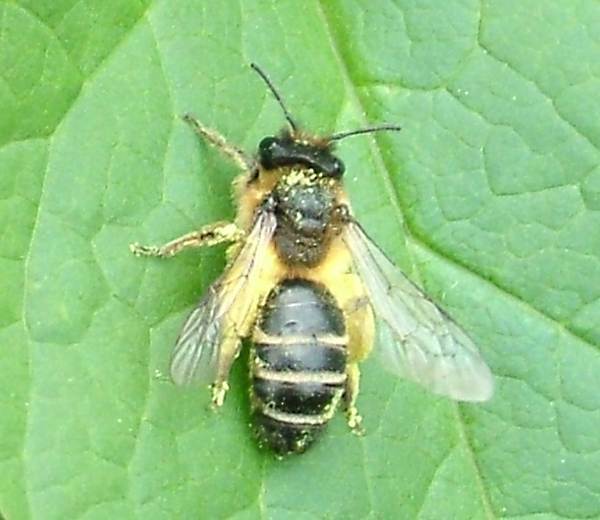 Lindauer reported that the scout bees are precisely the ones that had been experienced foragers in their previous careers. As H.D.Thoreau complained in an 1838 journal entry, "[when humans make a collective decision] the mass never comes up to the standard of its best member, but on the contrary degrades itself to a level with the lowest." ( Richard Nixon put it a little differently to John Erlichman [1971 white house tapes]: "You gotta remember the smartest thing the Congress did was to limit the number of voters... Out of three and a half to four million people, 200,000 voted. And that was true for a helluva long time, and the republic would never have survived if all the dummies had voted along with the intelligent people." ) If only the best decision-making bees become scouts (because bees can somehow assess their own abilities and do so honestly) then that human defect is avoided. The computer simulation described above was primarily designed to be "simple and reproducible" rather than "realistic." Making good collective decisions about independent-random-valued options often is harder than if the randomness is significantly correlated, a fact which made the simulated humans "look worse" relative to bees. But on the other hand: there usually are more bees than 1283, more candidate nest-sites than 10, and very imperfect knowledge of "dollar"-values by the bee voters (typically only 22% of the bee-scouts actually examine more than one nest site, and only 5% of the bees are scouts) i.e. in all these respects the bees usually have a harder decision-making job than the one faced by our simulated humans. 1. 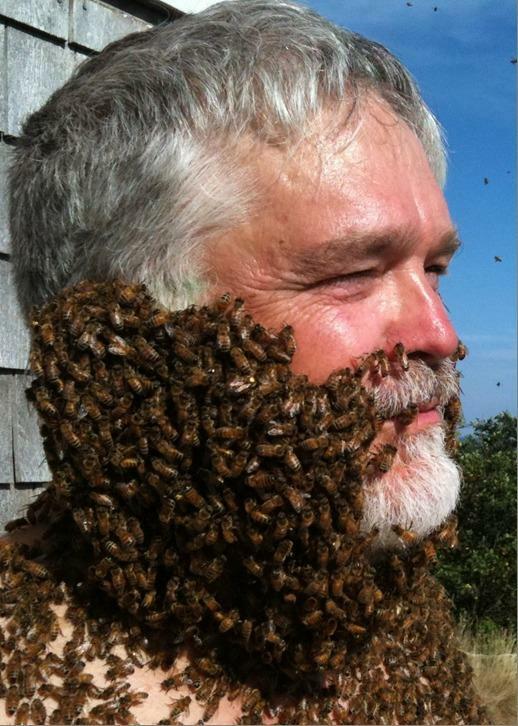 Most of the bees in the swarm find a branch to hang from in an energy-conserving "beard" formation (jpg), then sit there. 2. About 5% or fewer of the bees go scouting. If they find one or more candidate nest sites, they (after carefully inspecting the site for a duration of around 1 hour) return to the swarm and "report" (via "dancing" using a kind of sign language) both (a) where the best one they found is, and (b) how good they think it is. Better sites get more repetitions of the dance, executed with more vigor. Dances for housing reports appear to use the same sign-language as dances for food-location reporting, but the housing-related dances are much longer, lasting minutes to hours, versus seconds to a few minutes for food-location dances. 3. Some bees who wish to be scouts observe these reports and fly out to check the alleged sites for themselves (as well as, perhaps, doing their own exploring). Also, some bees who already have been scouts can choose to re-explore their own sites or the sites advertised by others. In all cases they report back as before, but bees re-exploring their old favorites, then re-advertise them with successively fewer dance repetitions each time, and once they reach zero, they "reset" themselves to an unbiased state. 4. So after some time has elapsed, multiple "camps" of bee scouts emerge, each camp advertising different potential nest sites. Comment: So far, what we have described is a vote-casting process very much like range voting with X's (intentional blanks): the scout bees cast numerical votes for each candidate nest site, with higher numbers (indicated by longer and more vigorous dancing) being better, and X's being cast for sites that scout has not examined. (And these numbers indeed lie within some range, since there is some upper limit to how long and vigorously a bee can dance.) But, this is only the vote casting part – we have not yet described how these votes get combined to obtain an election winner. In range voting, the combining process is numerical averaging. But is averaging beyond bee mental capacity? Averaging involves counting, addition, and division; and then you have to pick the winner with the greatest average, which involves understanding which numbers are greater and lesser; and then, even assuming some bee manages to do all that, the result has to be communicated to all the other bees, and they have to do this reliably, i.e. must be sure such communication is for real and not from some mentally-deranged bee who made a calculational or informational-transmitting error. All that is pretty difficult to do. So what do the bees do? 6. The bees' process for determining the highest average score is not completely perfect for several reasons. First, although eventually the highest compound interest rate wins, the bees cannot wait forever. The swarm only is willing to sit around for at most about 2 weeks. A late-discovered but better site might not have enough time for its higher growth rate to win versus some older discovery of a worse (but still pretty good) nest site. Second, if two sites very close in quality are discovered at about the same time, then their growth rates might balance exactly enough to prevent consensus. Third, there is a certain amount of "random noise" involved. Humans using exact arithmetic need not suffer from these imperfections and hence (in these respects anyhow) could be superior to bees. 7. The bees even have their own version of the CRV's notoriously kludgy "safety" rule d. As discovered by Kirk Visscher, the bees refuse to terminate an election until a "quorum" of at least 10-15 scout bees have explored a site, because otherwise (we presume) the quality of each site-evaluation would be too low. Quote: "We suggest that the quorum size is a parameter of the bees' decision-making process that has been tuned by natural selection to provide an optimal balance between speed (favored by a small quorum) and accuracy (favored by a large quorum)." The Point: In the ∞-time limit, the "bank account" with the greatest "interest rate" wins, no matter who was richest at the beginning of the process. The interest (i.e. recruitment, i.e. faction-growth) rate in bee-elections is by design/definition proportional to its range-vote score. ∴ The range-voting winner is the faction which eventually dominates. You can reassure yourself that the opposite extreme is favored by the ants. The bees' decision-making process can be interpreted almost exactly as "range voting with intentional blanks." They perform "averaging and choosing the greatest" by a rather peculiar (to humans) algorithm, but that is what it does. In my opinion, this is a very strong indication, from 20-50 million years of Darwinian evolutionary experimentation – bees with worse decision-making algorithms die out because they suffer a large disadvantage versus better bees – that range voting is a good idea. It seems unlikely there was a practical way bees could have used Borda, or Condorcet, or Instant Runoff voting. They certainly could have used plurality (with or without top-two runoff), or approval voting, or the simplified "123" form of IRV advocated by fairvote.org for use in San Francisco (that is, voters indicate only their top three choices in order, and then the usual IRV procedure is used), or a similar 123-simplification of Borda or Coombs – but those methods would have been far inferior. Martin Lindauer: Communication among social bees, Harvard University Press (Cambridge 1971); Harvard books in biology #2. Lindauer's masterwork is Schwarmbienen & Wohnungssuche, pp.263-324 in Zeitschrift für vergleichended Physiologie 37 (1955). This now is available in English (see "supplement" titled "House hunting by honeybee swarms" to P.K.Visscher: Group decision making in nest site selection among social insects, Annual Rev. Entomology 52 (2007) 255-275. Mary R. Myerscough: Dancing for a decision: a matrix model for nest-site choice by honeybees, Proc. Royal Soc. London B 270 (2003) 577-582. Thomas D. Seeley, P. Kirk Visscher, Kevin M. Passino: Group Decision Making in Honey Bee Swarms, American Scientist 94 (May-June 2006) 220-229. Michael S. Engel: Fossil honey bees and evolution in the genus Apis (Hymenoptera: Apidae), Apidologie 29,3 (1998) 265-281. Michael S. Engel: Monophyly and extensive extinction of advanced eusocial bees: insights from an unexpected Eocene diversity, Proceedings National Academy of Sciences USA 98,4 (2001) 1661-1664. Dear Dr. Smith. Thank you for bringing Range Voting to my attention. It seems extremely sensible, and I would like to endorse it. – Thomas D. Seeley, 17 July 2006. Several years after this page and his above endorsement appeared, Seeley published an excellent book Honeybee Democracy (Princeton University Press 2010). An excellent talk given by Seely on the subject is also available on YouTube. The dance language of bees was first decoded by Karl von Frisch (1886-1982) and described in his book The Dancing Bees (Methuen, London 1954). Their methods of "democracy" were decoded mainly by his student Martin Lindauer (1918-2008). Lindauer's studies were redone with modern video and computer image processing technology by Seeley and collaborators; this included discovering the "streaker" technique that "role model" bees use to guide the swarm to its new nest location after the election has ended. Honeybees are a keystone species with extreme economic/ecological importance – if they were to vanish it would make many food crops far more expensive, perhaps to the point where it would become infeasible to grow them and they would become extinct. See J.B.Free: Insect pollination of crops, Academic Press London 1993. After USA President Ronald Reagan and Secretary of State Alexander Haig accused Russia of using secret biochemical warfare called yellow rain in places such as Laos, Seeley suggested – and this was soon confirmed by a team led by Harvard biologist Matthew S. Meselson (1930- ) – that the yellow rain actually was just naturally-occurring bee poop! This would have been a great embarrassment for Reagan and Haig, except that they never admitted their mistake, nor did the Wall Street Journal editorial page, which continued to denounce this dastardly "warfare" for over a decade; meanwhile Reagan made up a new and even more fun set of lies about the Russians distributing exploding toys to Afghan children, etc. One criticism of range voting has been that it, if used for a two-candidate election, can yield a different result than a simple majority vote. Since no voting reformer particularly is interested in changing the voting system in the 2-candidate case – it is only for (≥3)-candidate elections that they consider voting system reform important – this criticism does not matter much. But as a matter of principle it is interesting to enquire which is a better decision procedure for 2-candidate elections: range voting or simple majority vote? With strategic voting the two are equivalent, but with "honest voting" (whatever that means) they could differ whereupon range voting presumably(?) is superior. The honeybees can help us with this question. Note that they always employ range voting, and never employ simple majority vote, even in 2-candidate elections (and even in 1-candidate "elections")! That is because the bees do not know ahead of time how many candidate nest sites there will be. (Since their "nomination" and "election" are merged and overlap in time.) So they are forced to use the same voting method no matter how many candidates appear. It is probably safe to say that honeybees have conducted at least a trillion 2-candidate elections via range voting. Estimate about 1% of bee-elections involve exactly 2 candidates. Assume/guess, in the 2-candidate case, that either simple-majority rule, or range voting, is a superior decision procedure by a margin of 10%. In that case, any bee subspecies which, whenever it noticed there were exactly 2 candidates, switched off range voting and turned on simple-majority vote, would enjoy a relative advantage (or disadvantage) of 0.001 on average. Given that bee-evolution has been able to invent a considerably more sophisticated democratic procedure than simple majority rule, it seems safe to say that it would have been able to invent this refinement, were it worth it. This 0.001 average advantage, amplified over 40 million years of evolution, would be 1.00140000000, which is enormous. Indeed, even a mere 40 thousand years of evolution would yield a selection factor 1.00140000≈2.3×1017. It seems safe to say, then, that the method the bees use, range voting without switching to simple-majority in the 2-candidate case, is best by test. The criticism is refuted. Refutation of bogus claims by Sutherland & Weyl about honeybees using "quadratic voting"